Hadassah International celebrates International Women’s Day 2015 by supporting Healing, Teaching and Research at the Hadassah Medical Center in Jerusalem. The Hadassah Medical Center’s multidisciplinary professionals know well that when you educate a woman, you educate an entire family! That’s why Hadassah has opened the Linda Joy Pollin Cardiovascular Institute for Women, which provides special health services to women, particularly those under served by the medical system. The Hadassah Medical Center’s Linda Joy Pollin Cardiovascular Institute for Women, has already impacted the lives of hundreds of Arab and Israeli families. The Institute is reaching out particularly to Israel’s Arab and ultraorthodox communities, where heart risk factors are higher. Rates of diabetes among Arab women are up to 50 percent, Dr. Zfat-Zwas reports. Diet and sedentary life style are major contributors to the problem. 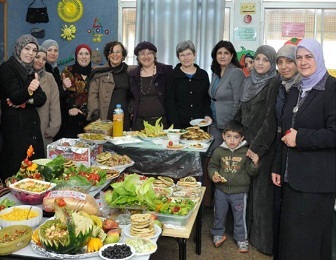 Hadassah’s Institute is working with Arab women to promote a change in their lifestyle behaviors. To that end, the institute has initiated several community programs. One entails reaching out through the local school system to Arab children, their mothers, and their teachers. “There is a tremendous difference in awareness in the neighborhoods we have already reached,” relates Dr. Zfat-Zwas. When she visited these mothers and children, she was told there are no more soft drinks in the house, no more snacks. The Institute also has plans to begin a new program with 1,000 “activist-minded” women in East Jerusalem. The goal is to motivate them to make health the next focus of their activism. By the same token, the Institute is focused on helping women to become their own health advocates—to be more effective partners with their physicians in promoting their own health and in effectively utilizing the health care system. The Linda Joy Pollin Cardiovascular Wellness (LJPCW) Center for Women at the Hadassah Medical Center is actively engaged in basic science and clinical research concerning gender health issues, as well as advocacy for gender health equity in research and treatment.